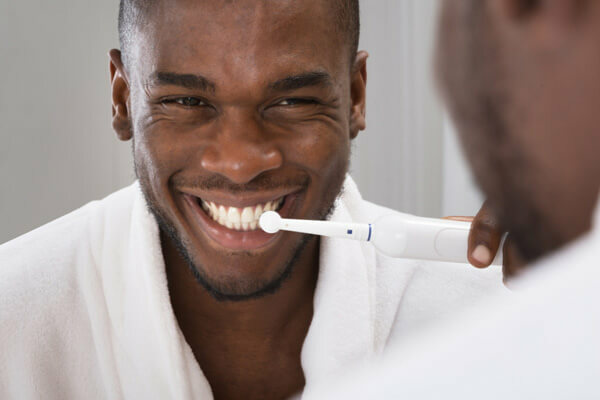 When it comes to choosing between a manual and a power toothbrush, it’s easy to get a little overwhelmed with the number of choices available today. Do you need one that focuses on gum health and gingivitis? Perhaps your biggest concern is removing plaque. Or, maybe you’re looking for a toothbrush that could make your teeth whiter. Ask a pro for help selecting the right toothbrush. One reason we have so many different toothbrushes to choose from is because we all have different oral health needs. The best way to select a toothbrush is to ask your dentist or dental hygienist for advice on choosing the right dental products. They’re the ones who know whether you need extra help cleaning between your teeth or that you tend to brush too hard. Power toothbrushes do much of the work for you. If it’s hard to brush your teeth, a power toothbrush can make it much easier to clean them. You still need to hold the brush at a 45-degree angle and make sure you brush all the surfaces of your teeth. You may brush longer with a power toothbrush. Do you brush for two minutes each time you pick up your toothbrush? Many power toothbrushes come with built-in timers that beep when two minutes is up. Some also will alert you when it’s time to start brushing a different section of your teeth. Power toothbrushes can indicate if you’re brushing too hard. You don’t need to scrub your teeth to get them clean. In fact, too much pressure can damage your teeth and gums. If you think you’re brushing too hard, look for a power toothbrush that can detect when you’re exerting too much pressure. Not everyone needs a power toothbrush. Manual toothbrushes, used properly, can effectively clean your teeth. If you love your manual toothbrush and it gets the job done, stick with it. One of its best features is that it never needs charging and it fits easily in a suitcase. You also won’t be that upset if you accidentally lose it on vacation or leave it across the country at your relative’s house. No matter what kind of toothbrush you use, remember these simple rules. Replace your toothbrush or toothbrush head every three months. When the bristles become frayed, they can’t clean as well. Never share your toothbrush. You’ll be sharing germs, too. Choose a soft-bristled brush. It helps prevent brushing too hard and damaging your tooth enamel. Brush twice a day for two minutes each time using a toothpaste that contains fluoride. Don’t forget to floss. Is it time for your dental checkup? Request an appointment at Konikoff Dentistry online or call 1-800-SMILE-23. Konikoff Dentistry has eight convenient locations with three offices in Chesapeake, one in Suffolk and four in Virginia Beach.